It never fails to amaze me that when it comes to being in the mountains no trip is ever the same. This thought struck me as being particularly true for mountains I climb a lot, like Kilimanjaro or my Local Pico de Aneto which at 3,404m is the highest summit in the rugged Pyrenean range. There’s always something or someone that makes the experience unique and keeps the dreaded ground-hog day blues at bay. This June’s first climb to Aneto’s lofty summit was made unusual by having the crazy Alex Ledger of Sky School Flight Centre along. Alex never travels without his paraglider and this climb was no exception. I have only heard of a few cases where madmen had flown from the summit but have never seen it done so was keen to watch the spectacle! Also along was Mike, our new chalet manager who is now running our 360 base here in the Pyrenees. (Papilio Chambres D’Hotes). A fine chef by trade but a chain smoker and a total novice mountaineer. A perfect candidate to entice into my world of ice axes and crampons. We walked into the Rencluse refuge looking like drowned rats. A huge thunderstorm had made our climb up quite interesting and made Alex worry about the prospects for his flights the next day. 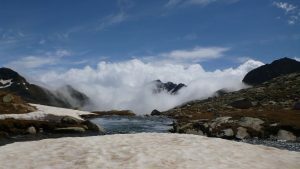 His doubts were further fuelled once we got talking to a few mountain guides (one of whom had flown from Aconcagua) about the next day’s wind direction: “totally not do-able, man, suicidal”. 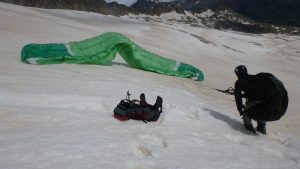 As we packed our stuff the next day I suggested not taking the giant green paraglider bag at all and just to climb the peak instead. But Alex wouldn’t hear of it and hoisted the monster onto his back. On the climb Alex watched the sky like a hawk and was continuously throwing snow into the air to test wind direction. It never stopped blowing from the wrong direction. I am not one to tempt fate so didn’t mention my doubts but was glad that we made it to the summit without too much drama and was looking forward to getting back down to the pub for a beer. Suddenly just below the top Alex got frantic. His keen senses had picked up a tiny waft of wind coming from the desired direction and before I could blink he had his big green wing out and was airborne! 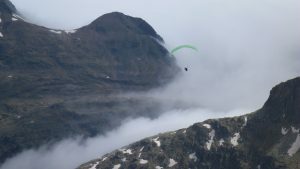 It was sensational to see him zoom into the sky and quickly disappear amongst the towering peaks. Less sensational was the fact that Mike and I still had to trudge 4 hours through wet snow to get to the car – a journey Alex did in less than 8 minutes. A few days later I was back again. This time with Irish John, a crusty bearded sea-captain and Matt, an aspiring mountain leader who will make a great outdoorsman and for whom (unbeknown to him) I have lined up a number of challenging Alpine routes on which he’ll get to lead the crux pitches. John Matt and I took a different route in this time approaching the mountain from France taking in a spectacular peak called the Savourgard on the way. 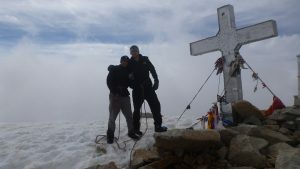 It seemed were we in a blizzard for the first 24 hours reaching the summit of Aneto in unusually cool summer temperatures! A balmy -12 C that was nicely recorded on my watch. That night back at the refuge the now familiar managers plied us with beers enjoying the fact that they were hanging out with a true Ozzie who’s climbers seem to always be a bit more crazy than the usual visitors. Just the thing they needed to spice up their jobs. What a great few days once again spent in my own back yard. If you are looking for an adventure along the lines of Kilimanjaro – Aneto Peak – Aconcagua – Elbrus – Mera Peak or Everest Base Camp in the Himalayas – etc, do get in touch with the office as we are rolling with all such expeditions with many more tempting ones on line.